VisionMobile has just released their new State of The Developer Nation Report for Q1 2016 that's based on the world's largest survey of software developers (over 22,000 participants from 150 countries). Let us walk you through it to see what's trending now as far as mobile, desktop, Cloud and IoT software development is concerned. Desktop development still prevails over other types of software development attracting 50% of professional developers. 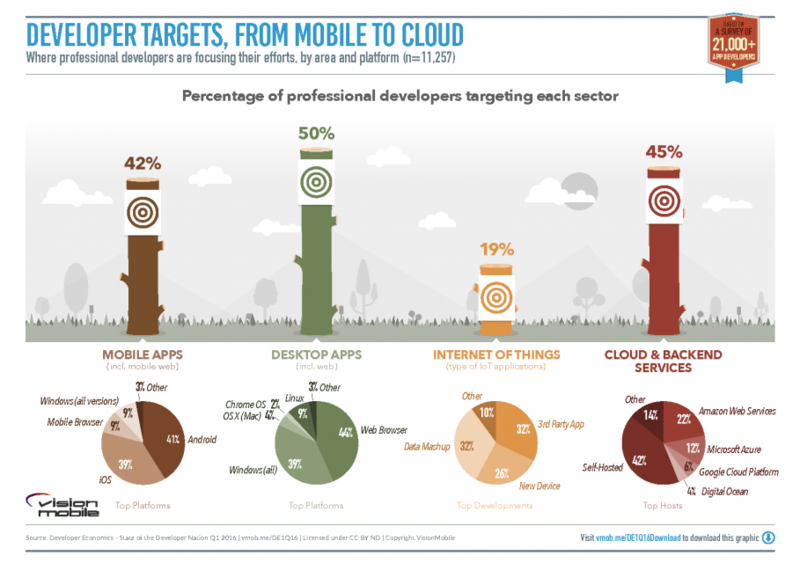 Near the same percentage of developers are targeting mobile web / mobile app development and Cloud / Backend services. IoT software development is currently attracting only 19% of developers worldwide (see below). Logically enough, developers are getting less experienced every year! The average experience level is falling as the developer population grows. Only 34% of developers are focused on a single sector, while 59% are normally involved in project development for 2 or 3 different domains (see below). In Cloud programming we can observe consolidation of language choices, with all popular languages gaining mindshare at the cost of the minority options. It's interesting to note that languages such as F# and Lua have all declined from the already-niche position they'd gained in Q1 2015. Java keeps the largest mindshare for those developing server-side code, both as a primary choice and part of their development portfolio. 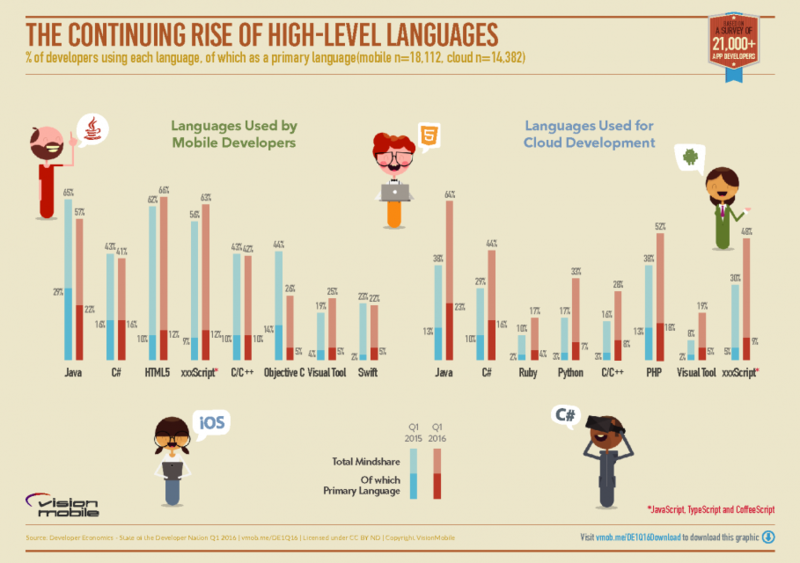 23% of Cloud developers claim Java as their primary language, up from 13% a year ago, and the trend is even stronger in the “also using” list where Java has jumped from 25% to 41%. 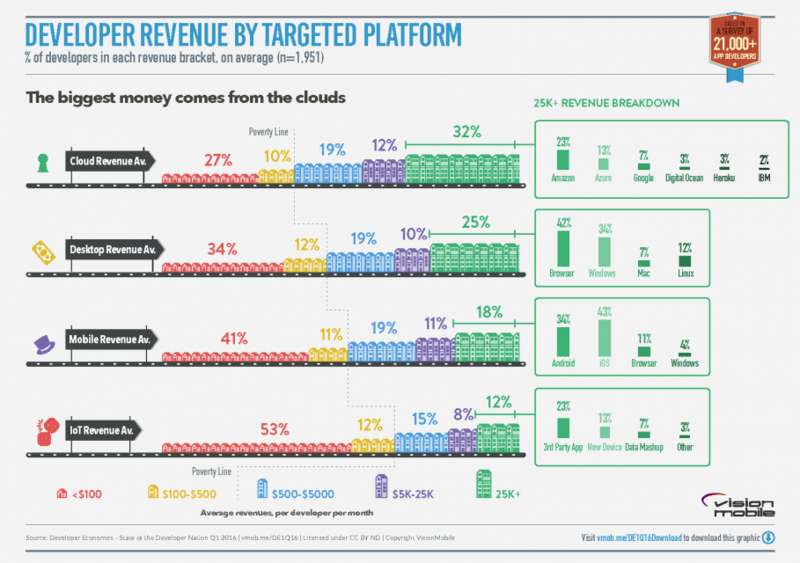 Cloud is the most profitable and IoT is the least profitable domain, according to VisionMobile: 32% of developers admit earning more than $25K per month from Cloud vs only 12% of IoT developers. It's notable that the majority of IoT developers (53%) makes less than $100 a month! (see below). Of all developers that make more than $25K a month, 43% are targeting iOS and 34% - Android application development. The commercialisation of IoT applications is still far from clear, in contrast to mobile and desktop, and the IoT revenue models for developers are still hit and miss. If we look closer at the top earners we can see that 42% of them are targeting the browser as their platform of choice rather than building native apps for a specific OS. 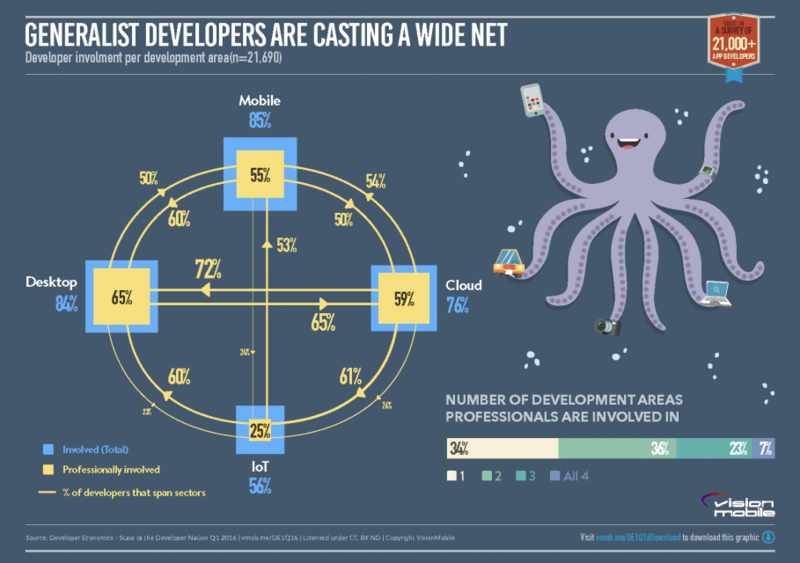 42% of professional Cloud developers host their own Cloud infrastructure. 65% of professional IoT developers are also involved in Cloud development, while 20% of amateur developers are already experimenting with Cloud. 63% of developers implement DevOps in their work and mention that DevOps has trained them to work effectively across boundaries. In conclusion, as the three most popular development sectors - mobile, Cloud and desktop - are overlapping now, developers can take advantage of it and exploit them to build applications focusing on all three at the same time. As IoT goes mainstream with existing and expected developments in m2m, machine learning, deep learning, sensors, etc., it will inevitably become the major game changer for developers. Do you have a software development project idea and need professional assistance with specification, PoC, prototyping, software development and QA? And what's your take on the survey?